Click Here to see a Dental being performed. Dental hygiene is an important part of your pet's health, because dental disease can be associated with other serious health problems such as heart disease and kidney disease. But how do you know if your pet has a healthy mouth? 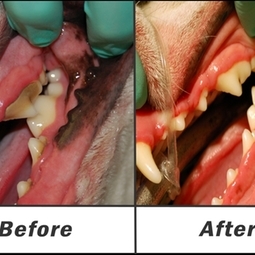 Let us examine your pet's teeth and gums to help determine if there are any dental issues you should know about. After a brief visual examination, we may recommend a more detailed examination (which requires sedation), a dental cleaning, or options for at-home dental care. Click Here to find out why Dental Care for your pet is important.